A couple of weeks ago, I posted my thoughts on my own personal freedom. I am so grateful for God’s word that reminds me daily that He has set me free. Free from things that hindered my progress like a negative self image. Thank God! I am free to be what God wants me to be. But, along with that freedom comes a great responsibility. I am responsible to be the person God created me to be as I lean on Him, and I am responsible to my fellow man. To many, freedom means living without boundaries and/or without thought to others. But, I think freedom is so many things. Like, I know I am free to choose what to believe about myself. I am free to abstain from practices that do not take me toward my goals and purpose in life. I do not have to conform! I am also very aware that we all have different struggles and weaknesses. I am very sensitive to that because I never want my freedom to cause anyone to stumble. Suppose you came out of a background that involved abuse of a certain thing. But I did not. I am of the opinion that by virtue of the fact that this practice may cause you to stumble, I will NEVER exercise my freedom in your presence. I feel that is my responsibility to you. The bible says, ‘Be careful, however, that the exercise of your rights does not become a stumbling block to the weak.’ 1 Cor 8:9. My love for my fellow man and my reverence for a God who saved me will not allow me to purposely entice you with my freedom. It’s like when I am dieting, my friends know not to eat chocolate in front of me. Not because they cannot, but because they know I should not. That is love. 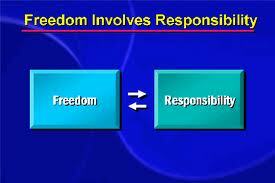 That is freedom and that is responsibility. This is a beautiful lesson on true love. God gives us freedom and his love shows us how to, or not to exercise it. Love it, Rita.